Ah, just when things seemed so promising! Don’t we long for just a few short years ago when the price of a barrel of oil was at a “fair” price at roughly its 10-year average? Were the benefits of low domestic US natural gas prices not boosting the future prospects for the US chemical industry? Were we chemical industry folks not getting downright giddy about the possibilities of actually entering a durable and sustainable period of time when we could increase and grow our level of exports? Well, it seems that just when things were getting going we are once again looking at a rapid erosion of the very fundamentals that created the expected good times. With suggestions that US monetary policy may tighten in the future along with other central banks across the globe loosening or sticking to their policies, investors can make higher returns from dollar denominated assets. Thus inducing capital investment and boosting the value of the dollar. However, while this may be the upshot for those with dollar assets, American firms that sell abroad are hit. According to the Economist, about one quarter of the profits in the S&P 500 are earned in foreign currencies. This is a fact that has not been lost on some chemical producers in recent results releases. Matters are complicated further when one considers the issue of oil prices and how the subsequent decline of commodities linked to oil have eroded profit margins. Of course, we were in the midst of many of the issues I discuss in this article when it was written. But what I found interesting was that it acted like a short-term time capsule. What I mean is that the factors discussed in that article fall into one of two categories. The first are issues that existed when the article was written and are currently ongoing issues. An example of this is the decline in the price of a barrel of oil. The second category deals with factors that were expected to occur at some point in the future. An example of this was the anticipation of the Federal Reserve raising interest rates at some uncertain date in the future. Well, in a few short months things have definitely changed! Where should we begin? How about the price of oil? I think we were still feeling pretty optimistic in 2014, right? Then, mid-year came. 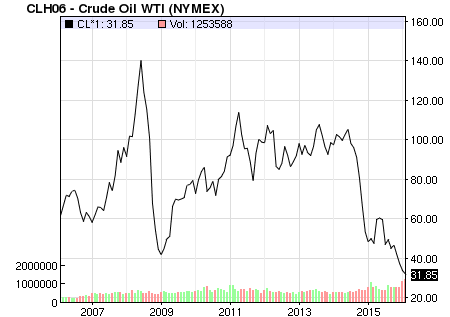 That is when the price of oil started its rapid decent over the past year and a half and it now stands at its lowest level in more than 10 years. In an environment of falling oil prices, and subsequently, the prices of the downstream chemical products, the expectation would be that chemical producers and suppliers would always benefit from this, as their costs of raw materials would go down. However, in practice a rapid and sustained decline in pricing fundamentals erodes profitability. Suppliers are expected to keep customers current on pricing, however when prices are falling faster than inventory replacement, suppliers end up selling at declining margins. This phenomenon affects the industry regardless of the other two factors discussed in this article. The next factor is the rise in the value of the US Dollar compared to other currencies. As this chart from MarketWatch indicates the US Dollar index has been on a steady upward march over the past 2 years and it stands at its highest level in at least a decade. As I mentioned earlier in this article, the chemical industry was just starting to hit its stride with the fundamentals for exporting improving. The rapid increase in the value of the US Dollar has really slammed the brakes on this momentum. The US Dollar index has been rising for a couple of reasons. The first is that when the global economy is volatile and there is broad-based political instability, the safest investments are in US Dollar denominated assets. The US Federal Government is still the surest place to be certain you will be repaid, so this factor causes the US Dollar to strengthen. The second reason, and why I called the Clarksons Platou article a short term time capsule, is that it talked about the anticipated increase in interest rates by the Federal Reserve. Well, that has now happened. The affect is to further encourage investing in US Dollar related assets. The end result of this increase in the value of the US Dollar compared to other currencies is to make the products we produce in the US relatively more expensive to overseas customers. The reason is that they will need more of their currency to buy a dollars-worth of goods. In other words, there will be fewer overseas customers able to competitively buy US-produced products. Now, one might think that chemical suppliers will still be able to sell their products to their US customers. That is true to an extent, but the problem is that much of the domestic chemical supply is sold to companies in the US who produce products they hope to export. If these downstream manufacturers see a decline in orders from overseas customers, there will be a consequential decline in orders for chemical raw materials. With these current factors and trends, in addition to so much turmoil across the globe, it is unclear when the favorable fundamentals of exporting will improve again. I have always found the key to maintaining success in the chemical industry is to not focus solely on the problems. Instead, with the negative influences factored into the calculus of business, refocus attention on what you do well and what has led to your company’s overall success. Just like when you are traveling, there is more than one way to get to a destination. The shortest or fastest might not always end up being the most efficient, when you consider all the criteria. Have a safe and successful business journey!